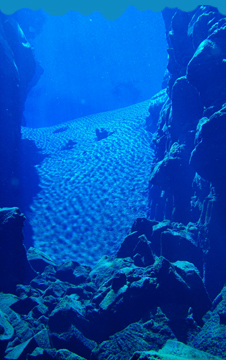 The Silfra area is about 600 by 200 meters big. From the parking spot to the platform it's about a 100 meter walk. Between the platform and the parking area is a pool which leads into the Silfra cave back towards the parking area. The deepest part of the cave is in fact underneath the road. The Silfra cave has only been dived by very few people and it beholds high risks for the diver since it's very deep (at least 63 meters), has some very narrow passages and the rocks that form the cave could be loose and collapse. The cave has been mapped by a group of American cave divers, but might have changed in the recent earthquakes. From the same pool into the other direction a tunnel leads into the main part of Silfra. This tunnel is referred to as the "toilet". The reason is that in order to get into the tunnel a diver has to go head first vertically into a tunnel down to a depth of 16 meters. It's the only opening from the Silfra cave to the Silfra crack and all the water that comes in through the underwater wells within the Silfra cave has to go through this narrow hole in order to make its way through Silfra into the lake. This creates strong current in the tunnel which literally flushes every diver attempting the tunnel-swim-through straight down (through the toilet) :-). Needless to say this swim-through is rarely done and if only with experienced dry suit divers with cavern-dive experience. Divers need to have dived with the DIVE.IS on an earlier tour and prooven their abilities. Underneath the platform where divers and snorkelers enter the water on the regular dive and snorkel tours is the opening from the toilet-tunnel. From here it's a short 30 meters swim into the Silfra Hall. Silfra Hall leads into a cave system with a maximum depth of 45 meters. Swim throughs underneath rocks & boulders can be done here at different depths. From Silfra Hall it's a 200 meter swim to Silfra cathedral. The swim is an up and down (for the diver) since at certain spots the diver needs to swim over rocks that have got stuck in the crack at shallow depths. Silfra Cathedral is litterally a divine section of Silfra. The beauty wants you to hold your breath. The depth of the fissure is about 20 meters at the deepest point and from the beginning to the end the cathedral is about 100 meters long. Divers and Snorkelers can see right across from one end to the other. To gaze through this section with the lava rock walls falling straight down is one of the most dramatic views underwater. In the end of the cathedral a sand slope comes up to a depth of 2-3 meters from where the current picks up and leads divers or snorkelers straight into the lake... if they miss the turn to the left into the Silfra Lagoon. The Silfra Lagoon is the next highlight for every diver and snorkeler. This is the place where the visibility is most apparent. From the entrance into the lagoon to the other side measures 120 meters and one can see all the way across. At the other side of the lagoon is the exit point for divers and snorkelers and from here it's a hike back to the parking area, which makes most people sweat :-). If you should ever attempt this walk, make sure to stay on the path and don't walk on the moses and grasses.